Gorkhaland is the name of the state demanded by the Gorkhas of India. 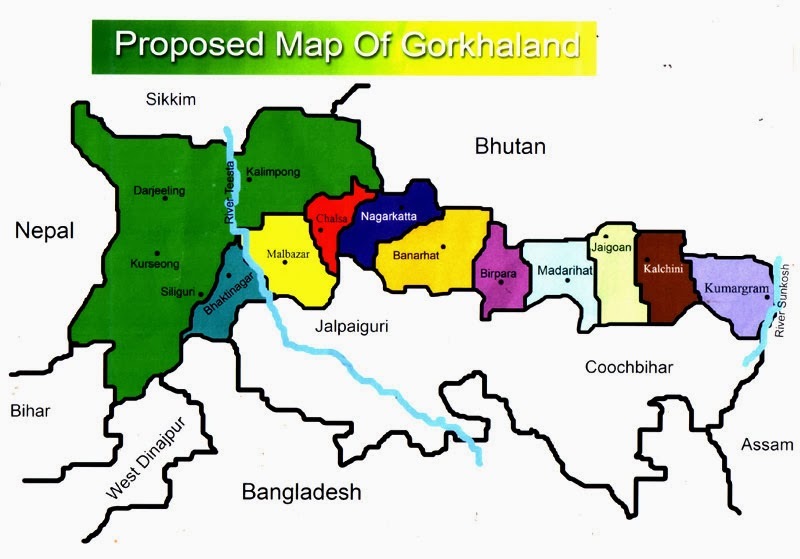 The proposed area of Gorkhaland includes the hills of Darjeeling district and the adjoining areas of the Dooars and Terai. Indian Gorkhas are Nepali-speaking people of India. The term "Indian Gorkha" tries to make a distinction between citizen of Nepal and the Indian citizens of Gorkha/Nepali ethnic group. Indian Gorkhas are citizens of India as per the Gazette notification of the Government of India on the issue of citizenship of the Gorkhas of India. However, the Indian Gorkhas are faced with a unique identity crisis with regard to their Indian citizenship because of the Indo-Nepal Treaty of Peace and Friendship (1950) that permits "on a reciprocal basis, the nationals of one country in the territories of the other the same privileges in the matter of residence, ownership of property, participation in trade and commerce, movement and other privileges of a similar nature". Thus, there are also many Nepalese citizens of Nepal living in India. The Indian Gorkhas are mistakenly identified as citizens of Nepal, which has led to several movements of the Indian Gorkhas, including the Gorkhaland movement, for a clear recognition of their Indian citizenship.